Recipient of Publisher’s Weekly Starred Review! On the move . . . again? Wondering when you will “arrive”? Almost There is for those on the move and those who feel restless right where they are. It’s for those who struggle with not belonging, with feeling unsettled, with believing that home is out of their reach, at least for the moment. And Almost There is for those who find themselves in a transient lifestyle they didn’t expect—say, moving across the country for a new job or the military or an opportunity to begin again. With imaginative storytelling and witty, relatable prose, Bekah DiFelice offers wisdom for those struggling to belong in a world where home is constantly shifting. When our hope of home is rooted in an unchangeable God, we are not uprooted, lost, or made homeless by change. We become found ones on the move. Bekah shares her story of discovering pieces of home in the most unexpected places. Keeping Place: Reflections on the Meaning of Home. Among the stories and thoughts that Bekah DiFelice shares in her debut book are her joyful passion and earnest quest to live live fully. 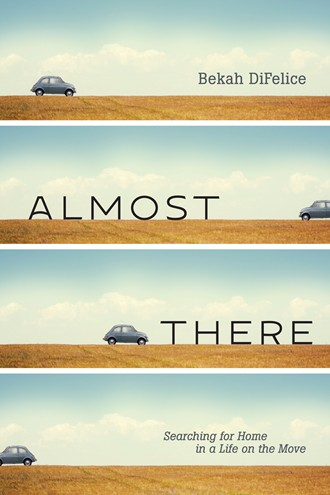 Almost There is packed with so many relatable themes, including fear, longing, doubt, and identity. Bekah's story will not only help you discover big and small pieces of your won story but will also encourage and inspire you to pursue your own new adventures, wherever you are. A beautiful storyteller whose heart for God and family shines, Bekah gives us all a gift of light and love in Almost There.